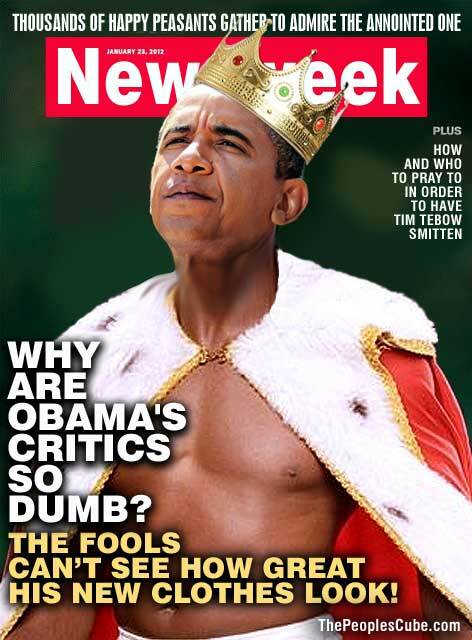 A little improvement on the latest Newsweek cover asking "Why Obama's Critics Are So Dumb?" 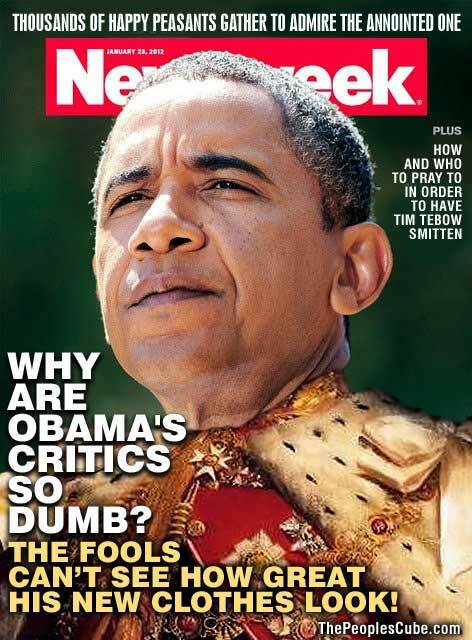 Indeed, the fools can't see how great his new clothes look! This is how Obama is seen by the smarter elites. 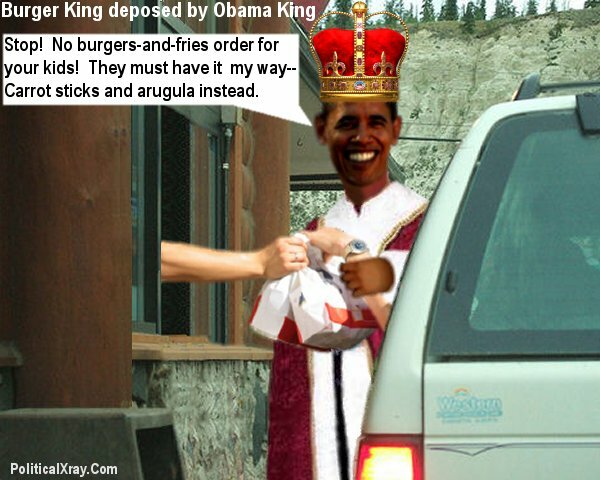 And this is how Obama is seen by the dumb fools and little children. Special thanks to General Secretary for inspiration! Of course, Commissar 0 must don regal robes and a crown because that is the only thing that the troglodyte Rethuglikkkans can appreciate in government. He simply wants to connect with the "dirty little unwashed targets nuthins" in His country. And now we understand even more graphically why someone said recently "Better someone with magic underwear than an emperor with no clothes". Has he donned his birthday suit to celebrate the day of glorious advent of his Bitter Half, the delightful and always fragant FLATUS (now with 50% less anger)? Her birthday is 17 January. Comrade Brain, I suspect that the unwashed masses couldn't handle the spectacle of Dear Leader in his true glorious birthday suit. Not that there would be much to see. But the sheer, blinding glory of his unclothed O-ness would surely cause at least temporary loss of vision and perhaps melt mainstream media camera lenses, which aren't cheap you know. I'm glad to see that Newsweek has raised the intellectual level of their political debate. They are rapidly ascending to Kindergarten. Yes!Papa Obama's critics are dumb and racists! I see our Glorious Webmaster is counterprotesting the SOPA protesters today by keeping the site online. You are doing a great service for the People™!!! I see our Glorious Webmaster is counterprotesting the SOPA protesters today by keeping the site online. You are doing a great service for the People™!! !SOPA is very important in the advancement of The Progressive World of Next Tuesday! We must counterprotest the SOPA protesters today and tomorrow and every day until the Internet is renamed the Sovietnet and we are in charge of dispensing the Current Truth to the toiling masses! A vigilant spy has discovered that the fascists in corporate media had stricken a Newsweek cover from being disseminated to a wider audience. I have obtained a copy of the Newsweek cover in question and am forwarding it to you in hopes that you can bring the workers of the world the truth!! Obama Media? What Obama Media?